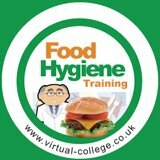 I’ve learnt a thing or two about food safety and hygiene this week, courtesy of an online course from Virtual College. Virtual College are a supplier of e-learning courses to business and industry, and have content covering a huge range of vocational subjects. I completed their Food Safety and Hygiene for Catering course, and I’ve got the certificate to prove it, having scored a collosal 93% in the final test. Not that I’m bragging, or anything. The course covers everything the budding food service worker needs to know about storing, preparing, cooking and serving food that won’t harm anybody. The tone of the course is excellent, and information is presented in a simple and logical way, with the participant’s understanding checked at key points through sample questions and tests. Online delivery of this type of content is ideal. It means that quality training is accessible to anybody, anytime, which is more flexible for both staff and their employers. The course is modular, and I completed it over several evenings, one or two five or ten minute chunks at a time. Food safety and hygiene is vital for food businesses – it’s the difference between success and failure, prosecution and imprisonment – but there’s a lot for the average amateur cook to learn too. I suspect that many domestic kitchens verge on being bacteria laden death traps, and whilst implementing a rigorous inspection routine complete with control checks and charts in a domestic kitchen would probably be overkill, knowing how to wash your hands properly and what core temperature a joint of meat should be cooked to are probably nuggets of information worth having. Right now, I’m off to clean the fridge out. It’s a real mess. The oven can wait until later. I think I might need professional help with that. Full disclosure: I was given a free logon to this course, for the purposes of this post. Thanks very much, Virtual College.